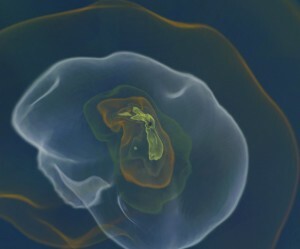 This rendering shows a direct gaseous collapse into a 10^5 solar mass black hole. The colors show surfaces of constant density. Rotational bar instabilities transport angular momentum outwards, driving the collapse to smaller radii. Distant observations of the most luminous quasars have determined that they are powered by supermassive black holes on the order of 109 solar masses when the universe was only 800 million years old. Two feasible types of seed black holes are the stellar remnants left by Population III stars, which are ~100 solar masses, and a direct gaseous collapse into a 105 solar mass black hole. In either scenario, the black hole must grow between 4-7 orders of magnitude in mass — a great feat to achieve in a small fraction of cosmic time. We have found in our simulations that the radiation created from accreted gas throttles further grow as the surrounding gas is heated and subsequently dispersed. We are developing models to accurately follow the accretion processes of black holes.